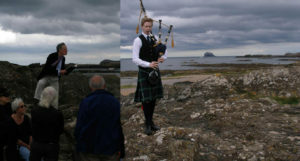 ‘Pipes to the Point’ was the première of the story of RLS’ return to North Berwick in 1887, following upon the death of his father in May of that year. On this occasion, RLS was accompanied by a young piper from the local school, echoing the playing of Alan Breck Stewart in Kidnapped. RLS reminisces and looks forward to his future triumphs. A great time was had by a fascinated crowd of onlookers both near and far (we are talking bagpipes!). The filming of the event will hopefully be turned into a thing of beauty and of much wider value.